With just the swinging of the pendulum, wonderful mandalas and totally new images take shape. 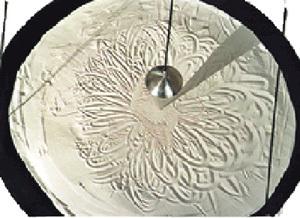 One gentle touch causes the pendulum to come into movement and draw curve by curve in the sand until the new picture appears, ending in perfection. A sand pendulum is very meditative to watch and it's patterns are always a new surprise.